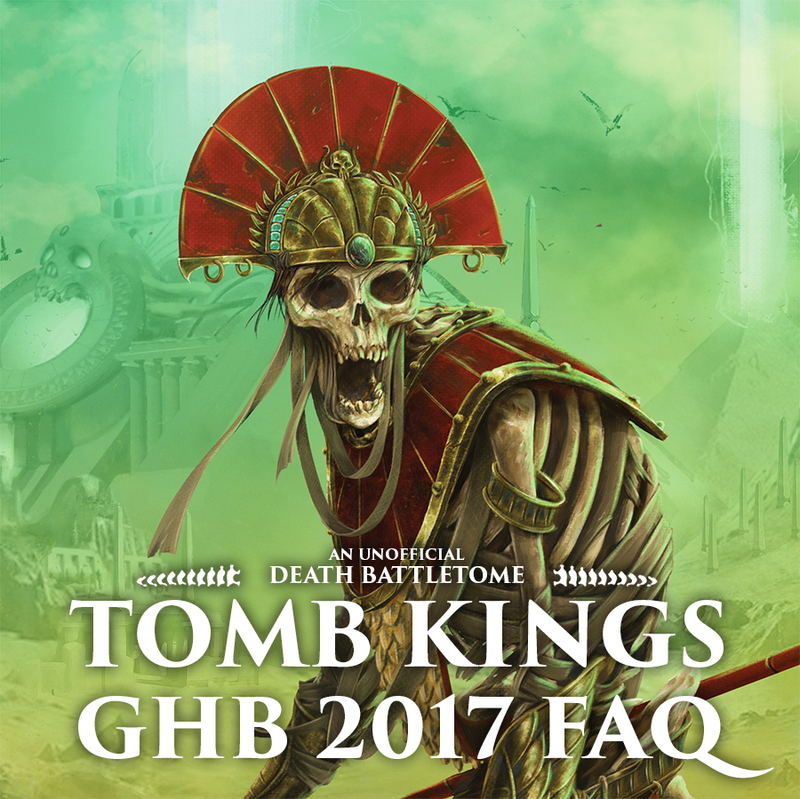 The new General's Handbook is here, and along with it some new and updated compendium scrolls, including for the Tomb Kings! This seemed like the perfect opportunity to release an FAQ on the Unofficial Tomb Kings Battletome and also take a look at some of the new opportunities the compendium updates allow us. 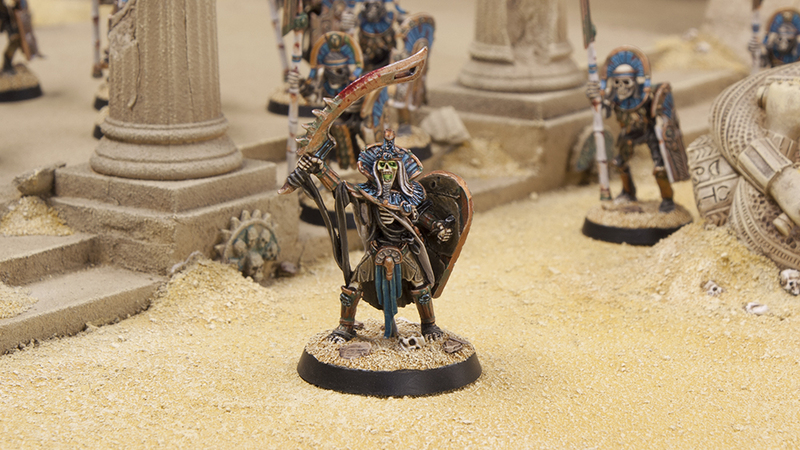 So, first things first, lets take a look at the new official warscrolls and points for the Tomb Kings. All of the points seem to be the same as the trial points we got earlier in the year, so there are no real surprises there. I pretty much agree with all of the points costs, except the Royal Warsphinx and Tomb King on Exalted Chariot may be a tad high, but nothing game breaking. 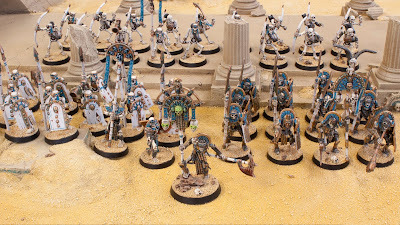 The Necropolis Knights definitely needed the price hike, because although they are a great unit, lets be honest, they were ruining the reputation of the Tomb Kings as a whole. 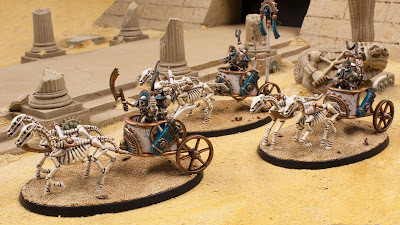 You may have noticed I said Tomb King on Exalted Chariot there and may be wondering what that is. Well, that's the other big change to the army, all of the special characters are gone and replaced with generic versions. 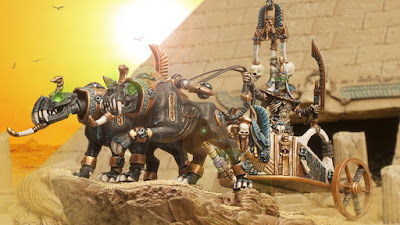 So instead of Settra, Khalida, and Apophas we get a Tomb King on Exalted Chariot, Tomb Queen, and Scarab Prince. These are more or less exactly the same as their previous warscrolls, but with new names. The Tomb Queen lost the ability against vampires and Neferata, but that makes sense since that was a Khalida specific thing. The most exciting thing about this is that there characters are no longer limited to one per army, and since they are no longer named characters they can take Command Traits and Artifacts! The only other change was to the Crown for the Tomb King in Exalted Chariot, where a rule has been added saying you cannot stack the same command ability on the same unit. This prevents you from taking two Tomb Queens and getting +2 to hit for shooting, or two Tomb Kings in Exalted Chariots and getting +2 to hit and wound on snakes for example. There are a few other changes, like dropping the word Khemrian from the Warsphinx and changing Skeleton Warriors to Skeleton Legionaries, but the second most exciting to me are the keyword changes. First off, everything now has the Tomb Kings keyword, just like what I already did in the Unofficial Battletome. The Mummy keyword has also been changed to the much cooler Embalmed keyword, the Liche Priest lost the Necromancer keyword and gained a Mortuary Cult keyword, and all of the Deathrattle keywords were changed to the brand new Desert Legions keyword. All of this helps give the army more of a unique identity, but the biggest change will be in how these units interact with other Death units. Necromancers, for example, can no longer use their spell on Tomb Kings units since nothing is Deathrattle. 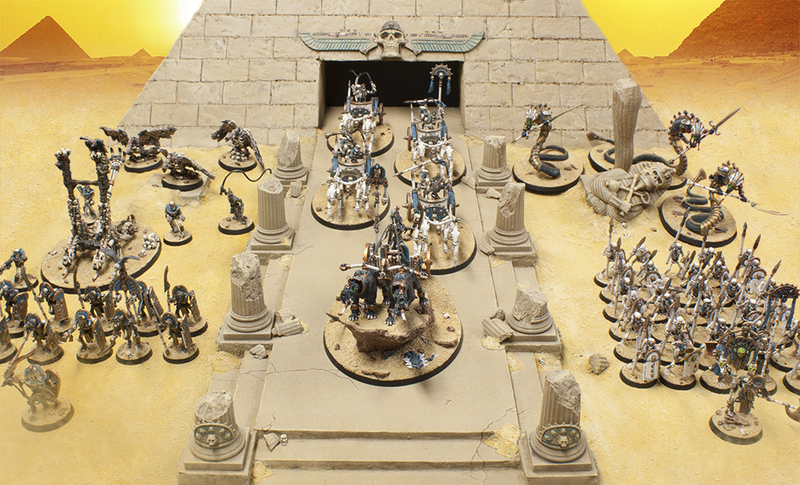 Tomb Kings also cannot take any allies or be included as allies in any other Death army. 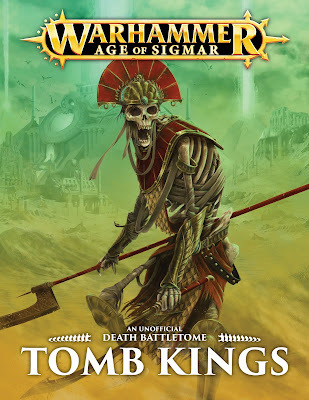 It's either pure Tomb Kings now or mixed Death if you want to include different units. The Necrosphinx has also been brought into line with the newest FAQ on the Stonehorn, halving the damage value of the weapons (rounding up) instead of halving the amount of damage taken, unless it's mortal wounds. 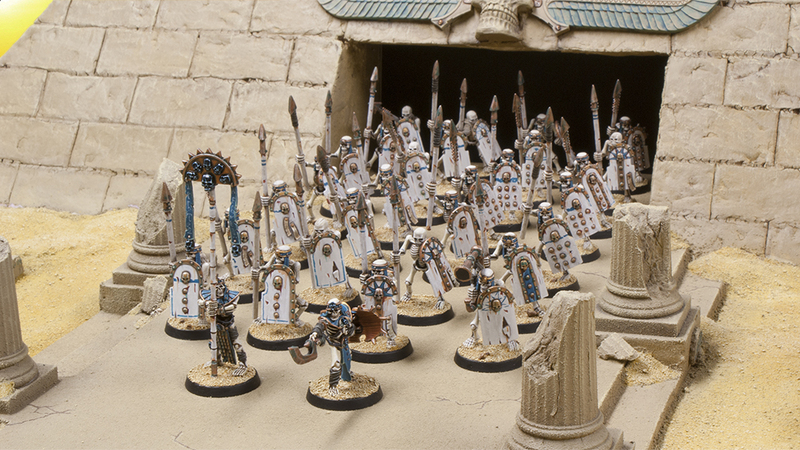 The Tomb Kings also lost all of their summoning abilities, which hurts, but to be honest, wasn't very in theme with them as an army. The Stone Shaping abilities were thematic, but their loss isn't a huge issue since personally I would rather cast Righteous Smiting or Mystic Shield with my Liche Priest. Last, but not least, both of the Warscroll Battalions have been removed, which was a compendium wide action. All in all I really like all of the changes made. 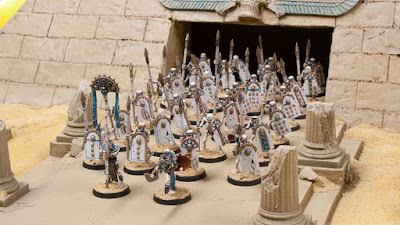 They open up some cool new opportunities with new heroes who can take traits and artifacts, and help separate out the Tomb Kings as their own army. The Keyword changes make them much more of a stand alone force, but are also just really thematically cool. So, how does all of this affect the Unofficial Battletome FAQ? Well, to start with, all instances of the Deathrattle Keyword have been changed to Desert Legions, and all of the existing warscrolls which are not marked with the word Unofficial, are to be replaced with the new ones from Games Workshop. Essentially you'll be playing the new warscrolls, with the four unofficial ones added in, plus the unofficial battalions, and allegiance abilities. I have also brought the Undying Servitude ability into line with the new Death trait in the GHB, reducing its range to 6" instead of 10". I also changed the Death Incarnate command trait to increase that range to 10" instead of increasing the roll. I really want to make sure I am not making this Unofficial Battletome more powerful than other stuff and want to make it as balanced as possible. Some other changes include toning down the Destroyer of Eternities, getting rid of an unintentionally overly powerful combo with the Shapesh's Soul Storm artifact and one of the spells, and adding in some more fun rules for the Liche Staff. I also adjusted the Phalanx Cohort battalion to allow you to re-roll Battleshock tests instead of ignoring them. The rest of the changes are to clear up wording, or bring wording more into line with the new warscrolls. Lastly, I also got rid of the Tomb Legions and Royal Chariot Legion battalions since GW is no longer supporting them. I also increased the points on all of the Warscroll Battalions to bring them in line with what GW has done with all of the other armies. The plan is to release a version 2.0 of the Unofficial Battletome once I have gotten some more feedback, which will incorporate all of these changes directly into the Battletome, until then I have the FAQ which you can download below. If you have any questions on any part of the FAQ please let me know in the comments below.